U.N. Paris climate talks: Even the architects of the agreement are pessimistic. 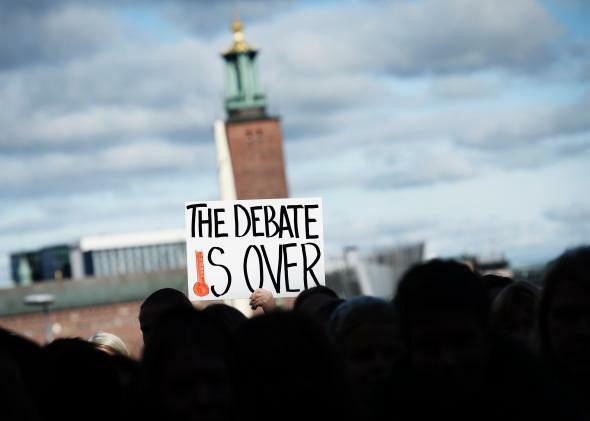 On Sept. 27, 2013 in Stockholm, protesters outside the U.N. Intergovernmental Panel on Climate Change demand immediate political action. Actually, you can. Because keeping climate change to less than 2-degrees Celsius—the arbitrary point at which scientists and world governments have agreed is the start of “dangerous interference with the climate system”—is the entire goal of the U.N. climate negotiations. That’s it. That’s what the world is fighting for. All of the eggs have been put in that basket. Now, I don’t know about you, but that doesn’t seem very hopeful. I mean, honestly, what is the point of even conducting these talks if your boss says—10 months in advance—that you will fail? It’s too bad we’ve wasted the last two-and-a-half decades since climate change first emerged on the world’s diplomatic radar—the world’s carbon dioxide emissions have increased by 61 percent since 1990​, matching or exceeding projections for the worst-case emissions*—but the world can’t sulk in failure forever. Instead, we should use this opportunity to admit that, when it comes to the climate, the U.N. process is irreparably broken. If we at last write off the U.N. process, it may help the world finally make progress on climate by instead turning to local, tangible actions that could energize people and bring about real change. This is further evidence that the action on climate change will shift to what are currently perceived to be radical solutions. Absent meaningful action by governments, it’s up to individuals to demand change: nonviolent direct action and mass protest, a rethinking of capitalism—in short, a revolution in culture and society—are suitable to the job of limiting climate change to levels that don’t threaten entire ecosystems and thus human prosperity. Just because this sort of change is unlikely doesn’t mean it isn’t necessary. *Correction, Feb. 5, 2015: A previous version of this post incorrectly said the world’s greenhouse gas emissions have increased by 34 percent since 1990. Actually, it’s the radiative forcing—the cumulative warming effect of greenhouse gas emissions on the climate—that has increased by 34 percent since 1990. Global carbon dioxide emissions have increased 61 percent since 1990.